Last week Canada’s much-anticipated new Food Guide was launched by the Honourable Ginette Petitpas Taylor, Minister of Health. The new guide focuses not just on the healthy choices you should make—have plenty of vegetables and fruits, eat protein foods, choose whole grain foods, make water your drink of choice—but also healthy habits—cook more often, enjoy your food, be mindful of your eating habits, and eat meals with others. With an emphasis on mindful eating, more plant-based proteins and less highly processed foods, the new guide is being celebrated as a definite improvement by many. 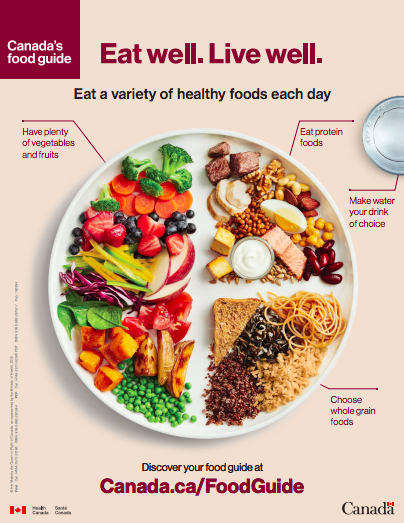 The Food Guide, which comes as a part of Canada’s Healthy Eating Strategy, offers a number of online tools and resources to share the new recommendations. The Food Guide is an important document for Canada, as it is integrated widely by governments and stakeholders into nutrition policies, programs and resources, and is taught in schools and promoted by health professionals. The guide also influences the foods served and sold in Canada’s public institutions, such as daycares, schools and long-term care facilities.